By Rachel Pevsner Crum, D.O., Ricardo Restrepo, M.D., Nolan Altman, M.D. A 13-year-old boy with asthma, gastroesophageal reflux (GERD), multiple food allergies, and history of 2 uncomplicated right middle lobe pneumonias within the last year presented to the emergency room with persistent cough and fever (max 102˚F) for 10 days, despite macrolide antibiotic treatment. A chest radiograph was performed in the emergency, followed by an esophagram/upper GI and CT examinations after admission (Fig 1). For parapneumonic effusions and abscesses which are expanding or compromising respiratory function, percutaneous drainage should be considered. Ultrasound guidance is preferred, as it allows for realtime localization of collections or abscesses. Direct visualization under ultrasound is advantageous for catheter insertion and manipulation through septae or thick loculations that can interfere with drainage. In children, CT should not be used routinely; CT-guided drainage should be avoided, when possible, due to the potential risks of ionizing radiation in the pediatric population.2 Adjunctive tissue plasminogen activator (tPA) can be administered via a percutaneous catheter to promote drainage of an abscess by lysing fibrin strands.4 At our institution, we routinely use tPA for drainage of loculated effusions and empyemas with good results, although use of tPA is controversial in the literature. 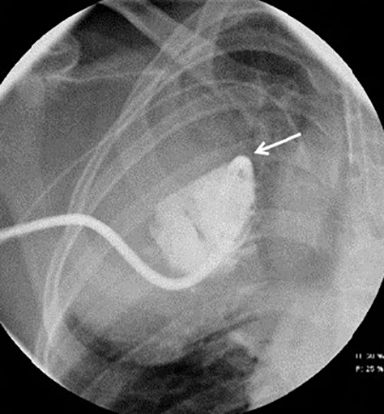 One major complication of percutaneous drainage is the formation of a bronchopleural fistula; however, these may also occur directly from the complicated pneumonia alone. Tissue plasminogen activator is contraindicated if a bronchopleural fistula is present. Other major complications of percutaneous drainage include pneumothorax and hemorrhage. Radiographs often show a large cavitary mass with thick walls; air-fluid levels may be seen. CT may not be necessary on a routine basis, as radiographs may be sufficient for the diagnosis. Contrast-enhanced CT may be useful for delineation and extent of disease but should only be performed for worsening respiratory symptoms. 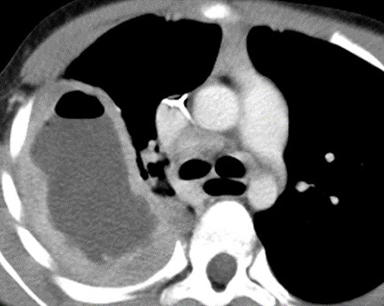 On CT, pulmonary abscesses are usually round with thick walls and irregular luminal surfaces. Vessels and bronchi terminate abruptly at the abscess edge, and the walls of the abscess form acute angles with the chest wall.7 On ultrasound, abscesses are seen as a thick-walled collections containing echogenic pus and debris. Internal septations and bright echogenic foci with dirty shadowing from intraluminal air may be seen. On radiographs, empyemas appear as loculated effusions with convex borders or consolidated lung. On CT, empyemas are often lentiform in shape, compress vessels and bronchi, and form obtuse margins with the chest wall.7 Uniform thickening of the visceral and parietal pleura form the “split pleural” sign previously described in the literature.7 Pleural enhancement is usually present and greatest along the visceral pleural. Ultrasound is important, as it can distinguish fluid which is not readily defined on chest radiographs. Ultrasound of an empyema defines pleural thickening, loculations (which may have a honeycombed appearance), fibrous strands, and septae in the pleural space. 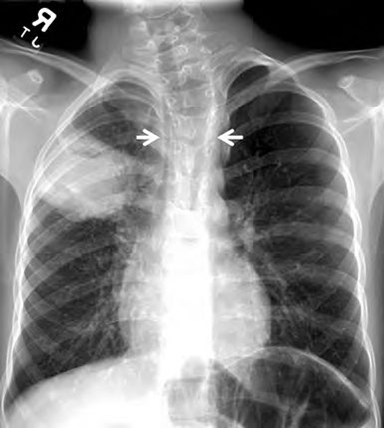 On chest radiographs, necrotizing pneumonia appears as a large consolidation which may or may not contain small lucencies or cavities. CT is more sensitive than radiographs for evaluation of cavitation.6 Unlike pulmonary abscesses, necrotizing pneumonia on CT demonstrates loss of the normal lung architecture, decreased parenchymal enhancement, and absence of a thick wall. On ultrasound, consolidated lung will have multiple small cystic and hypoechoic areas with decreased or only mild peripheral color flow. Pulmonary abscess secondary to occult aspiration from underlying esophageal achalasia. In summary, children with recurrent pneumonia should receive follow-up imaging to document resolution of the infectious process and exclude an underlying pathologic process or mass. In our patient, the underlying cause of recurrent pneumonia — and ultimately abscess formation — was occult aspiration due to primary achalasia. Although our patient had been treated clinically in the past for gastroesophageal reflux, an upper GI was not preformed until an observant radiologist recommended the study for a dilated esophagus noted on chest radiographs. Pulmonary abscesses in children are commonly related to pneumonia or aspiration. Children usually have an excellent prognosis with conservative medical management and no significant long-term sequelae. Percutaneous ultrasound-guided drainage should be considered if clinical symptoms do not improve, the abscess enlarges, or there is impending rupture into a bronchus. First-line ultrasound should be considered to distinguish between complex and simple parapneumonic pleural effusions, as it is effective in delineating loculations and septations. Cohen E, Weinstein M, Fisman DN. Cost-effectiveness of competing strategies for treatment of pediatric empyema. Pediatrics 2008; 121:e1250-57. I M Balfour-Lynn, E Abrahamson, G Cohen, et al. BTS guidelines for the management of pleural infection in children. Thorax 2005; 60: i1-21. Calder A, Owens CM. Imaging of parapneumonic pleural effusions and empyema in children. Pediatr Radiol 2009; 39:527-537. Grevais DA, Levis DA, Hahn PF, et al. Adjunctive Intrapleurral Tissue Plasminogen Activator Administered via Chest tubes Placed with Imaging Guidance: Effectiveness and Risk for Hemorrhage. Radiology 2008; 246:956-963. Alsubie H, Fitzgerald DA. Lung Abscess in Children. Journal of pediatric infectious diseases 2009; 4:27-35. Donnelly LF, Klosterman LA. Cavitary Necrosis Complicating Pneumonia in Children: Sequential Findings on Chest Radiography. AJR 1998; 171:253-256. Stark DD, Federle MP, Goodman PC, Podrasky AE, Webb WR. Differentiating lung abscess and empyema: radiography and computed tomography. Am J Roentgenol 1983;141(1):163-167. Emanuel B, Shulman ST. Lung Abscess in infants & Children. Clin Pediatr 1995 34:2-6. Bartlett JG. Anaerobic bacterial infections of the lung and pleural space. Clin Infect Dis 1993; 16:S248–255. Crum RP, Restrepo R, Altman N. Cavitary Lung Mass in a Febrile Child. J Am Osteopath Coll Radiol. 2014;3(2):21-24. Rachel Pevsner Crum, D.O., Ricardo Restrepo, M.D., Nolan Altman, M.D. Drs. Crum, Restrepo, and Altman work with the Department of Radiology, Miami Children’s Hospital, Miami, FL.